why does graphene 2.11 not translate my website. For example: The button “continue reading…” is not translated to german “weiterlesen…” and “Filed under” is also in english. The theme’s language files are maintained and updated by volunteers. In your case, the German language file has not been updated for the latest version of the theme. I used Poedit and translated “Filed under %2$s” to “Veröffentlicht unter %2$s” to german. I saved the .po and .mo file. Then I uploaded to the server and overwrote the 2 files. I overwrote the Child Page (Child/languages) and the original theme page (graphen/languages). But There is still the text in english. @jhule, can you send me the language files so I can test it? Yes I will! Thank u! Maybe I am to stupid 🙁 to translate the Files. Just to confirm, you have changed your site’s language in “WP Admin > Settings > General” to Deutsch, right? I’ve also have this problem. My site is setup to “Norsk bokmål” (Norwegian), everything but “Continue reading” is translated to norwegian. I’ve checked the .po for the norwegian translation and it seems to have been translated into “Les mer” in the file. But it still shows “Continue reading”. Hm…yes I have changed the site’s language in “WP Admin > Settings > General” to Deutsch! What do I wrong? I use a child theme with the function.php above. 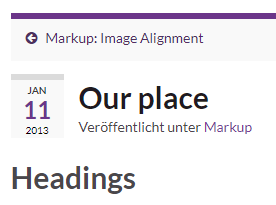 Is this the reason why “Continue reading” is not translated? I found the mistake. In the folder “wp-content/languages/themes” there were the 2 files “graphene-de_DE.mo” and “graphene-de_DE.po”. Maybe the files were from graphene version 1?!? Now graphene 2.x is in German!!! The website will be translated and the settings in the backend! Maybe, this is the solutation for you “kak”?? ?